From the octagon to the big screen, the world's greatest Mixed Martial Arts Champions come together for the first time in a major motion picture. 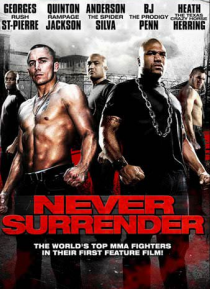 When an MMA world champion is lured into the illegal world of underground cage fighting by an elusive promoter, he quickly realizes that the only way out is to kill or to be killed. In a place where some fight for glory and some fight for the fight; he w… ill fight for his life. Now, in his greatest effort to come out on top, he can never look back, never show weakness, never leave... and NEVER SURRENDER.